I just seem to have awesome luck, or maybe it’s just good timing? 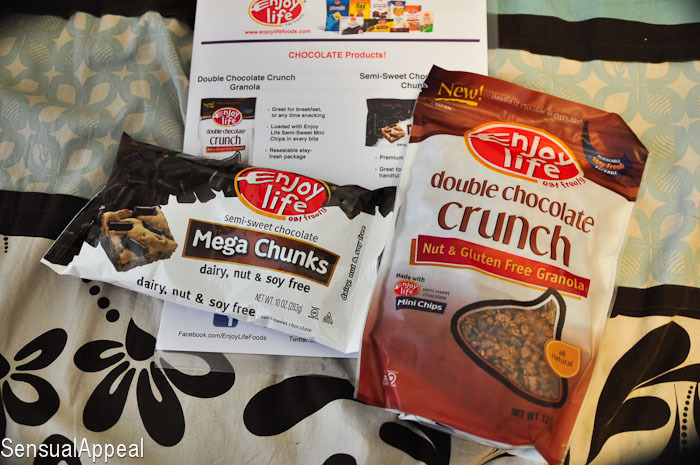 As soon as I ran out of chocolate chips the other day, I get a package from Enjoy Life with these semi-sweet chocolate mega chunks and double chocolate crunch granola. I love good timing! 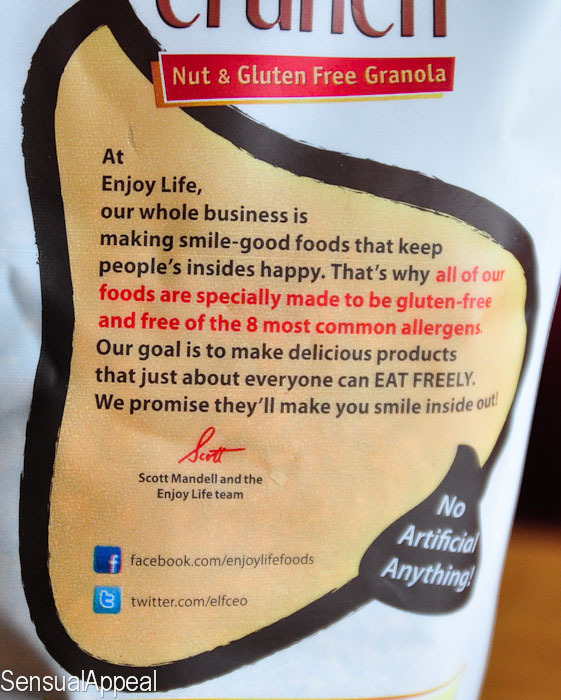 All Enjoy Life products are gluten free and allergy friendly. I really like companies that are committed to helping people lead healthier lives without sacrificing flavor and quality. Enjoy Life is one of those companies. All of their products contain NO: wheat, dairy, nuts, egg, soy, fish, shellfish and most are free of potatoes, sesame, sulfites, and casein. In addition to the allergen info, the products contain no artificial ingredients, no GMO ingredients, nor trans fats. Love these stats. We all know I’m more and more of a health freak as I get older and I spend a lot of time searching for the right products, it’s nice to find companies which are totally and entirely dedicated to healthy lifestyles. 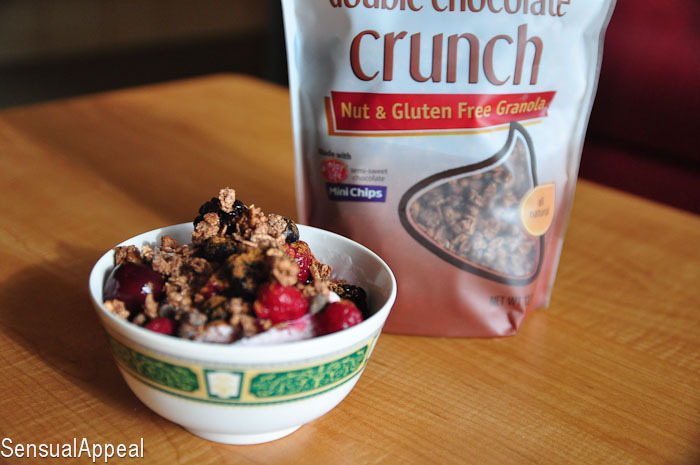 The Double Chocolate Crunch Granola is delicious. I haven’t had any granola in a long time but I’ve been recently thinking about getting some. And there it comes, pop, perfect timing again! 😛 I put some on top of Lifeway’s frozen kefir with berries [read about it here]. It added a deliciously sweet crunch to the ultra smooth healthy dessert. I love love love healthy desserts! They make me happy. The Mega Chocolate Chunks are awesome as well. Very chocolatey and they are vegan! Deliciousness. 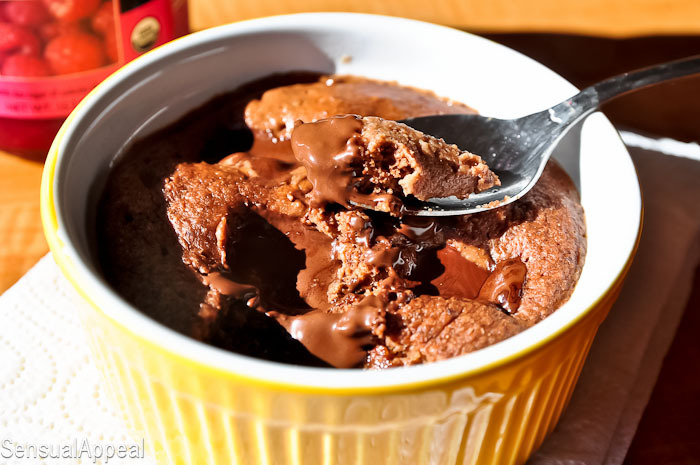 I recently tried them in my quick molten lava-esque chocolate mug cake recipe (instead of the sugar free chocolate) and it worked perfectly! Just the right amount of sweetness and I love the dark taste of this chocolate. I definitely threw in a lot more chunks in there than I specified in the recipe too to make it extra chocolatey… that’s how much I loved it 😉 The chocolate was melty and tasted amazing! Ohhh everything looks so good!! What a great bunch of goodies! I don’t lead a GF or Vegan lifestyle, but I do love to incorporate into my life.